So, those of you who've been following this blog for some time have come to realize that I'm an LG fan, but not so much a tablet fan. Tablets... well, to me they've had their time. They can be pretty one-dimensional. What I mean is that there's not a lot of scenarios that I personally find them useful in except for consuming media (reading articles or watching Netflix). For me, something like that doesn't really play in my day to day uses. But then I found myself with some down time recently, and let me tell you, that actually came in very handy. I was on a trip and had many hours in a car, and then I went camping and it was nice to have something like this. The right size, just the right amount of processing power. Definitely a welcome tool in those times, and then it became easier to use it in others. This new LG G Pad IV 8.0 is a nice upgrade from last year's device. 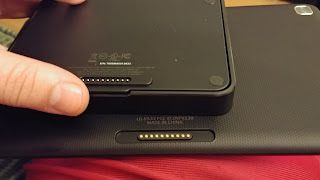 Similar to last year they've kept the SIM tray for on the go data (just gotta get a tablet plan for it... I was going to test it with my Roam card, but the area I was going didn't have coverage). 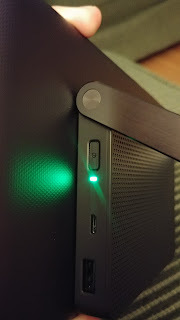 They lost the USB port, which is fine by me, but I was puzzled that they didn't use USB-C at this point in the game, instead we're left with microUSB, which is fine still. And it matches the power pack port (more on that later). 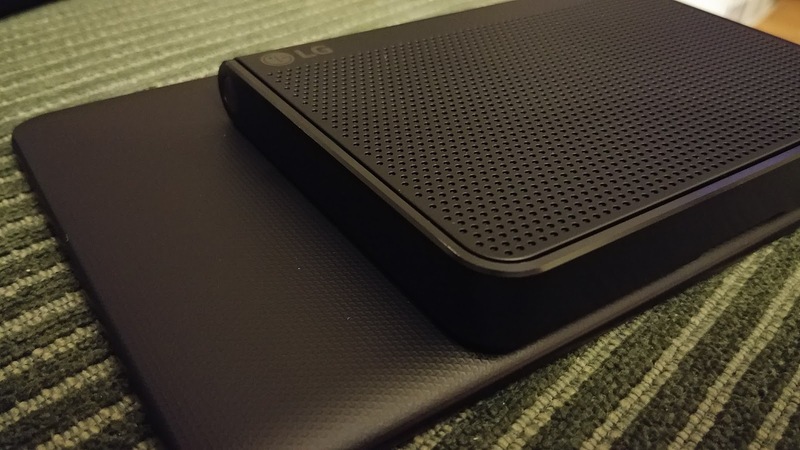 The G Pad Plus Pack adds in 4,400mAh of battery, and an external speaker. And it's this extra bit that makes it really a neat device. I'm trying to locate pricing for it yet. The tablet itself is so similar in performance and experience as last years. It's just powerful enough to run the apps I need like Netflix and etc... even a couple games. My heavier games there's a definite notice of lag. Which is fine. I want this to play movies, read me stories and peruse articles. It does that just fine. The apps are so very similar that it's hard to tell what device it actually is from the LG lineup. It's got the swatch of Microsoft mobile apps and the Q Pair where you can pair up your phone to the tablet to get your text messages, phone calls, etc... I never really got it to work so well for me, but then again I don't often muck about with that stuff. What I liked about last year's, and is still there this year, is the 'q button' or convenience button that will put the tablet into 'comfort mode' (essentially taking out the blues so it's easier on your eyes at night time... I don't know about battery savings tho'). Okay, so back to what really makes this shine is the power pack. So, first up the device lasts and lasts. with now 7,400mAh it will last a long long time. I watched 2 movies and the pack wasn't even empty yet. 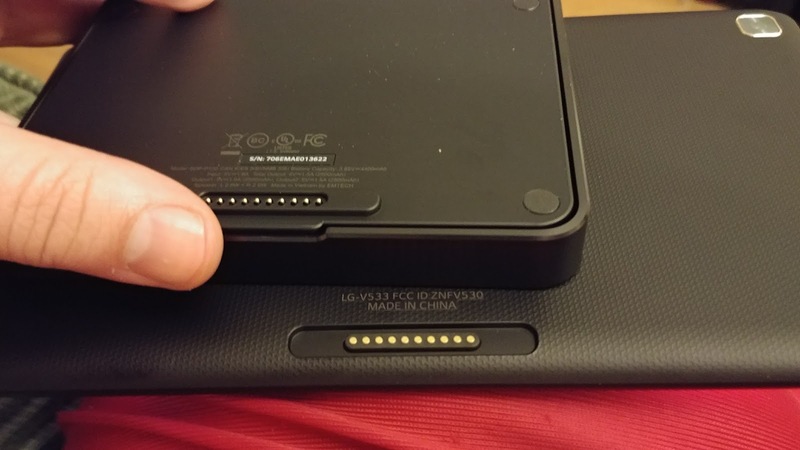 And that's kind of an annoying thing; unlike the Moto mods there's nowhere to see how much battery the pack has, aside from the lame colour scheme on the side. Green is like 80% or more, orange is... well is it 50%? Red is that anything below... it's hard to know for sure. My 6 hour trip the pack was empty and I think I had still about 80% battery. So, 2 movies, and just read my book as well as listened to music. So battery is pretty amazing. Speaking of music, the pack also doubles as a speaker, which was pretty handy while camping. Got to watch a movie with my son in the tent and it was loud enough for us to watch, but when I went outside the campsite it was barely audible. So it's able to provide a good amount of volume without being intrusive. Now, the best feature of all for the pack is that it acts as a stand for the phone. Sure that's neat when you want to do work on the device (I'm still not as sold as using tablets for work purposes); but it's even better as a bit of a hand holder. Pry open the stand bit a little bit and you can slip your hand in just so. Don't go running with it, or trying to flip the stand piece all the way to 180degrees and try holding it, the magnets holding it in place aren't that strong. I have dropped it once that way. But still, a neat little innovative use for the device. 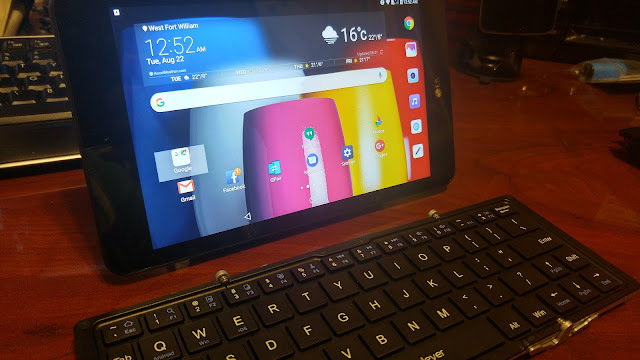 All in all, if you're into tablets, this is a nice partner. Especially for those of you looking to use it for school ... quick emails, check social media, write up a paper, research on the net... it'll handle just fine. Pair it with the pack and you've got a pretty neat duo. So now you can go sit in the commons and listen to your music with friends and not worry about the battery life all day!